"Sounds like you need to own up to some of the things you've done." 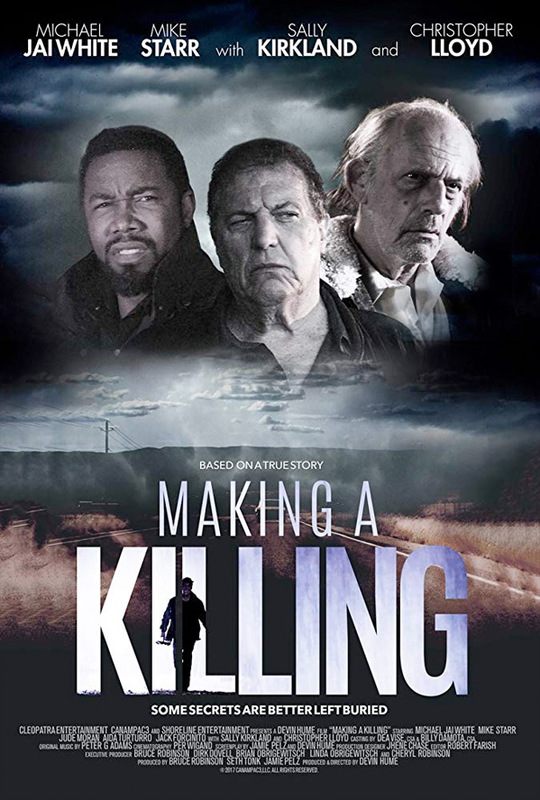 Cleopatra Entertainment has released an official trailer for a film titled Making a Killing, a crime drama from filmmaker Devin Hume. The film is about three morticians who get caught up in a web of greed and deceit, involving buried treasure and a tangled love affair, in this modern day crime mystery that is, apparently, based on a true story. Michael Jai White stars in this as Officer Hudson, along with Mike Starr, Jack Forcinito, Sally Kirkland, Aida Turturro, and Christopher Lloyd. This looks crazy weird and wacky and totally low budget, not really in a good way. The best part about this is Michael Jai White, who looks like he's having all kinds of fun in this role with the cowboy hat and all. But this film really looks quite awful, thankfully the trailer is free to watch. Arthur Herring (Mike Starr) is the mayor, priest and mortician in a small town called Cardinal. His brother Vincent Herring (Jude Moran) is his right hand man and together they are well-respected pillars of the community. Arthur and Vincent agreed to safe guard a small fortune of rare coins for a friend, Lloyd Mickey (Christopher Lloyd) another mortician and convicted felon. When released Lloyd wants his coins back but the brothers have other plans. Just as the brothers think they are in the clear, a tenacious detective, Orlando Hudson (Michael Jai White), comes into town to investigate the town’s first murder in 30 years, in this twisted crime mystery that is based on a true story. Making a Killing is directed by American filmmaker Devin Hume, making his feature directorial debut after a few short films and work as a cinematographer. The screenplay is written by Devin Hume and Jamie Pelz. Cleopatra will release Hume's Making a Killing in select theaters starting August 10th coming up soon. Anyone interested in seeing this?